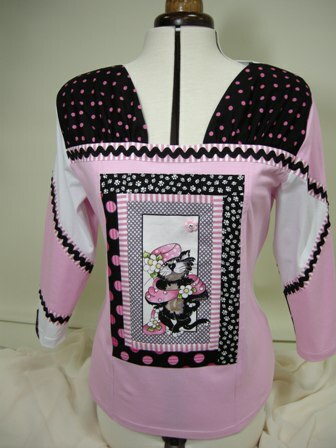 Would you like to learn how to make one of Maree’s Designer Tops? 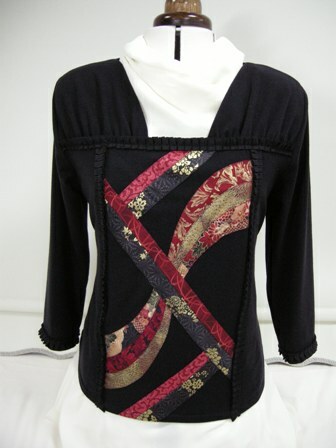 Maree is currently working on gorgeous Designer Tops for her upcoming workshops. The designer top workshop No.1 will take you through step by step instructions on how to turn your basic T-Shirt Top into an original one of a kind designer top! As you can see here Maree’s first design has a Japanese influence. A second design – The Crazy Cat! Third Design Silver and Black for the Evening. Eileen Hampson from Melbourne has been following Maree Pigdon’s Sewing Projects in the Australian Stitches Magazine for years. A keen sewer for most of her life Eileen had a wish at 90 years old to visit Maree at her Sewing Studio Rosewood Cottage. Eileen’s wish came true on Thursday 25th March 2010 when her daughter Anne and son-in-law Geoff brought her for a special luncheon and to meet Maree in person as well as Jacqueline and some of the other lovely sewing students. Eileen said she had a ‘Golden Day’ at Maree’s and highly recommends others to make the time and an appointment to visit. Watch this wonderful short video of Eileen and Maree on the day. 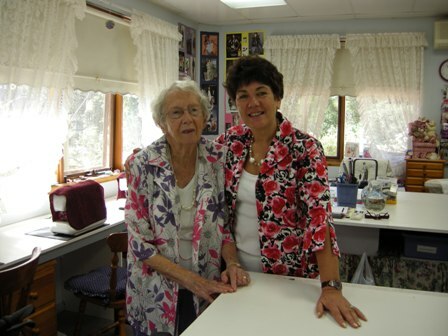 Pictured below is Eileen with Maree in Rosewood Cottage Sewing Studio. 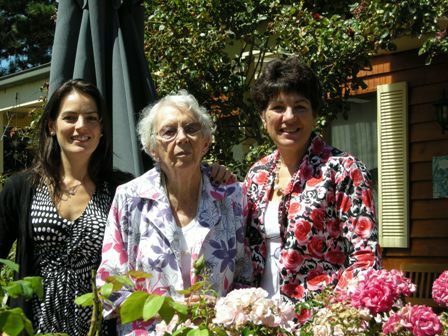 Pictured below is Jacqueline, Eileen and Maree in Maree’s rose room garden. As you can see Eileen had a fabulous visit to Maree Pigdon Sewing Studio and it was a delight to have her visit along with her daughter Anne and son-in-law Geoff. Please come and visit again! Maree’s Invisible Zip Sewing Secret!! In Maree’s video sewing demonstration today she shares her Invisible Zip Sewing Secret that helps you sew invisible zips with ease. If you don’t know it you must watch this video to find out and apply it into your sewing techniques!